Totally Twisted is hot off the press and on the shelves! Won’t you join me as I chat with the author (and friend), Kerry Bogert, about her very first book? Things did get a bit twisted here, as Kerry decided to interview me! Grab a hot cup of coffee and stay a while……. we’ve got a surprise for you at the end! Kerry: Oh My Stars, CINDY?!? Can you believe it?!? Totally Twisted is finally here!! Okay, give me your first impressions when you first got the book in your hands…. Cindy: Kerry, so much was running through my mind when the book finally came in the mail! As I carried the envelope in to the house, I actually savored it for a moment before I tore into the package. I paused and remembered long ago when you first shared your dream of writing this book. There’s that time that sticks in my head….standing on the sidewalk in front of Panera, listening to you on the phone excitedly telling me how you signed your contract to write the book…. And I’ll admit I had tears in my eyes when I first held the book in my hands and saw your name in print. Then I think I started wildly waving your book around, showing it off to whoever was in hearing range….which was of course the boys. But they already knew you as the “famous” one. 🙂 It was truly incredible to share this journey in some small way…. hearing the stories from you from the start: how you finished your first chapter, selecting the amazing lampwork artists whose beads are featured, traveling to Colorado for the photo shoot (and getting your nails done! ), sending in the big box of finished projects, all of the editing, finding out the title you chose would be a go…… Wow, I guess I could go on and on….so, my first impression when I got the book? VERY EXCITED! Kerry:Now come on, honestly, did you ever think that the lady that chatted with you on the B&B forum, and came down to teach you lampworking for a weekend, was going to end up writing a wire book? Cindy: Yes. 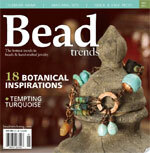 Back in the early days when we hung out on the Bead and Button forum, you were already drawing a crowd – eager to see your latest lampwork beads. 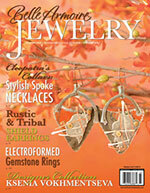 Your style evolved in to a natural combination of glass beads combined with wire work. I just knew you were destined to go places with your jewelry….early on you created designs that were strictly your own style. I remember when you were excited about your very first wire tutorial being published…after that it was a steady stream of publications. You were just destined to write a book…it all seemed to flow so easily for you. 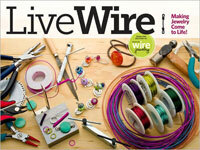 You had something fresh and exciting to offer in the world of wire work, and I think the publishers saw that right away. Kerry: What is your favorite project in Totally Twisted? And you know how each project has a really colorful layout to the page designs, which project has your favorite color combo? 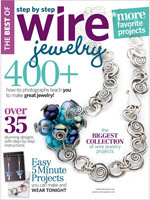 Cindy: You know I’m going to say it’s hard to pick just one favorite (there are 25 cool projects in this book! )…so I’ll pick two! “Bang Gals” are just so colorful and one-of-a-kind. You’ve really created a signature style that’s full of dimension and interest, and nothing like you’ll find in any other wire bangle. I like how this was selected as the first project in the book! Another absolute favorite is the “Twirl-a-Gig” necklace. This one’s an over the top amazing piece of art jewelry. It’s a little mind-boggling how you create these links – wire coils, spirals, and lampwork discs all linked together to create a show-stopper necklace. I dream of making one like this some day…. And you asked about my favorite color combo? I do love your classic bright colors, but I can’t resist the projects done in blue combinations such as “Catching a Wave”, “Delightful”, and “Split Personality”. You’ll see in a minute that I’m drawn to blues in jewelry…. Kerry: You know how me and you get going when we chat right, we could go on and on, so I will just ask one more question… how are you going to do the giveaway for the extra copy of Totally Twisted that you have?!? Cindy: You’re right! I’m giving away a copy of Totally Twisted to one lucky blog reader! What better way to celebrate the release of your book! Leave a comment on this post -I’d love to hear from you! This is all you have to do to be entered in the drawing. Join the Totally Twisted fan page on Facebook – here. If you already own this fantastic book, please name your favorite project! The winner will be randomly drawn from all entries…. the deadline is Twisted Tuesday (visit Kerry’s blog for her Tuesday blog segments! ), March 23rd, 11 p.m. EST. Winner to be announced here on Wednesday. P.S. 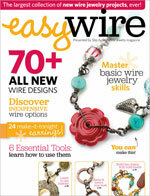 Kerry’s book has been such a helpful resource to me, even though I have some wire experience. I think you’ll find that too. 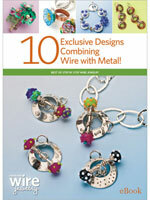 From simple things like reminding us to file the flush-cut ends of wire, to challenging us with advanced wire techniques (“Refined”) – there really is something for everyone in this book! I just couldn’t wait to try some of the projects! I created a couple of Kerry’s designs and have to report that the instructions are so clearly written and just about all of the steps are shown photographed. 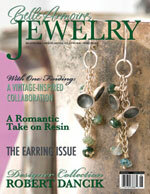 How could I go wrong…..I used Kerry’s beads but with my twist – oxidized sterling silver wire. Congratulations Kerry on your book! And thank you Cindy for this post! The book looks truly amazing. I can’t wait to get a copy! I have entered to win this book in other giveaways with no luck, but maybe this will be lucky one! If not, I’ll just end up buying it because I HAVE to have it! 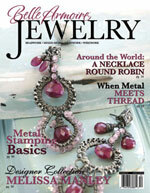 Great interview, and I love the pieces you made! Thanks for the giveaway!! Hey guys!! Great interview. I already have my copy but Catching A Wave is my favorite too….Tee Hee…I wonder why???? I want this book, I have been following Kerry’s blog and her work is amazing. 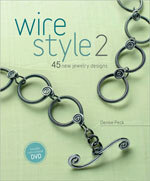 I would love to get my hand’s on a copy of this book (B&N didn’t have 1 when I went the other day) because I am new to wire work and never thought of using colored wire. Just joined you FB fan page! Great give away! Thanks to both Cindy and Kerry! Looking forward to getting my hands on this great book! Great interview. Read it twice! Thanks for sharing with us Cindy and Kerry. Her work is so amazing and the book would be such a treasure to own. Thanks so much for the chance to win a copy of the amazing book. I’m already in dreamland imagining the arrival of the book and an entire weekend devoted to enjoying the book from cover to cover. I’ve got this linked in my sidebar to help spread the word. I am so happy for Kerry. I can only imagine how she must feel with this accomplishment of getting her book published. A huge CONGRATS to her. Hey Cindy, a beautiful combination, your wirework and Kerry’s lampwork beads ()and her design from her book. Absolutely stunning. Hmm..my favorite project. I need to look through the book again. But I totally agree, it’s very well done and it will be hard to choose just one, but I will..I will be back. Love this post and the book looks fantastic. 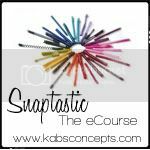 Cindy, you introduced me to Kabs Concepts, and now I’m such a fan. Thanks for giving us this chance! I love the interview. You’re both too cute. I love the bracelet! I would love to make on like that. Oh my, the projects look just amazing!!!!!!!!!!! Can’t wait to see the rest of the book!!! What a great interview. I have Kerry’s book and I am a member of the book on Facebook too. I love the twist you have to add to the jewelry too. The bracelet is amazing. If I were to win the book I would give it to Lorelei. I am just thankful to enter the contest and am trying to see if I wil have time this summer to create for Kerry’s book. 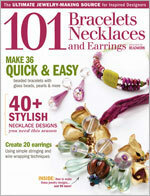 I love the book–there are so many techniques that I could tweak a bit and teach to the children that I teach jewelry making to…. 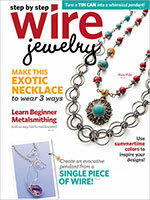 Love to add more wire work to my skills, I am mostly a stringer. great posting. Congrats on the book! 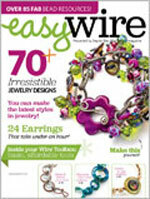 I had seen your work inspire some of my lampwork friends on Etsy (Lara of Lutrick and Eileen of DorsetHillBeads), and I immediately bought a back copy of Step by Step Wire Jewelry to learn how to make rings. Your work is beautiful! I’m a facebook fan, too. Thanks for the giveaway! Loved the interview and Kerry’s work! would love to have Kerry’s book in my library! Looks so fun! Ok, this book is totally awesome. I am mostly a beadweaver at the moment, but have wanted to get into wire for a while. (too many projects, not enough time). 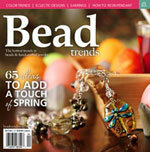 I can tell if I won Totally Twisted, I would have to abandon the seed beads for the wire and lampwork world!! Congratulations on such an awesome achievement Kerry!! I’m so excited for Kerry…long time fan! Kerry’s book looks totally cool! I would love to be the winner! NOw that the contest is over, I can comment!! I didn’t want Cindy accidently random number generating my comment, LOL! Thanks to each and everyone one of you for your support of Totally Twisted. I never could have wrote it without you all. Your encouragment and praise is what gave the confidence to write this in the first place!! I just can’t thank you enough.